Home > Mutual Funds - SIP > Investing in Mutual Fund SIP: NACH Form & Benefits..! Investing in Mutual Fund SIP: NACH Form & Benefits..! 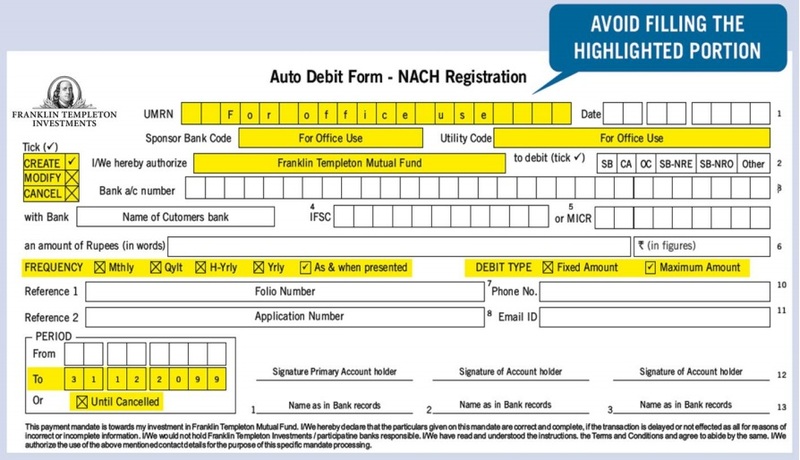 National Payments Corporation of India (NPCI) has implemented the National Automated Clearing House (NACH), a web based solution for Banks, Financial Institutions, Corporates and Government to facilitate interbank, high volume, electronic transactions which are repetitive and periodic in nature. What are the objectives of NACH? NACH is a centralized system, launched with an aim to consolidate multiple ECS systems running across the country.  leverage on distribution footprint and technology to provide a modern, robust platform to handle large volumes of repetitive payments. provide a single set of rules (operating and business), open standards and best industry practices for electronic transactions which are common across all the Participants, Service Providers and Users etc. and removes local barriers/inhibitors.